Anderson Hickey™ File Rails, File Bars for side to side filing. Lateral file rails for Anderson Hickey / Premier file cabinets that are 30", 36" & 42" wide . Lateral File Bar provides side to side filing in Anderson Hickey File Cabinets. "New Style Lateral File Bar. 2-5/16 High Double Hook. Specify cabinet size: 30, 36" or 42" exterior width. 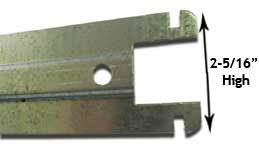 "Old Style" Lateral File Bar provides side to side filing.